For the start of the day, we would have two options, both are somewhat off the general direction because of lack of bridges to cross the river. We could go East all the way to Kaunas, and cross the river there. 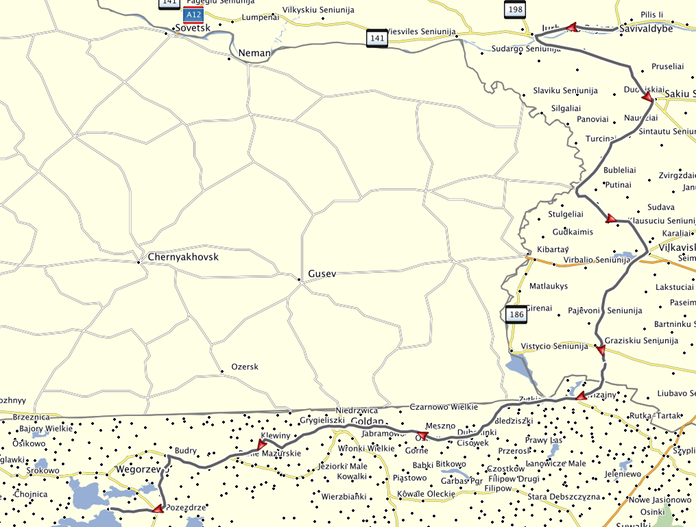 The shorter option is to go West and cross at Jubarkas, followed by small side roads in a generally southern direction unti we get close to the Polish-Lithuanian border. Unpaved roads have been excluded in the planning with but one exception. The crossing into Poland will use a side road for about 7 km, which is unpaved and dusty, leading towards the first village on the Polish side of the border. I was in doubt whether there would be a border crossing, but discovered a road sign at the turn-off on the Lithuanian side which directed towards the next village on the Polish side across the border – so, there must be a crossing. Once in Poland, the route continues to the southwest and west into the hills of Masuria, passing through lots of farmland, forests, small villages and little towns. Roads are small and pavement could be rough at times, but from I have seen on Google Streetview the countryside is very pretty. It should be really nice to ride, but do not expect it to be flat – rolling hills as far as the eye can see. Camp will be near Grizyko, surrounded by the biggest lake of the district. We will stay for two nights to explore the surroundings and rest. The area should be rather busy; it is a major vacation spot for many Poles, so here food shops and restaurants should not be our concern. There are no major towns halfway. The one place we could look for would be Wizajni, a village of 1.000 people some 6 km south of the border, about 120 km into the day. The next real town would be Goldap with more of a choice, about 160 km into the day. This would speak for a two-stop strategy on this day. Accommodation: Reservation confirmed for two nights. The campground has a restaurant where we could have dinner and breakfast. The next shop to buy food is 3 km from the campground. Prepare for a relaxing Sunday and have your mosquito repellent within reach.